Theravada - Theravada Buddhism is the oldest form of Buddhism, established in India, home of the Buddha himself. It is sometimes referred to as Hinayana by other Buddhist branches, but some consider this pejorative because it means 'lesser or smaller vehicle.' This name came about because the focus is on individual realization or becoming an 'arhat' or awakened being, as opposed to working for the enlightenment of other sentient beings, as in Mahayana Buddhism. Theravada Buddhism focuses on critical investigation of reality and awareness based on one's own experience. The Four Noble Truths are central to Theravadin philosophy and practice. The Pali Canon is the the scriptural canon for Theravadin Buddhists, composed primarily of talks attributed directly to the Buddha, and commentary on them. Traditionally, Theravada Buddhism has placed a strong emphasis on monastic life, and had separate practices for laypersons. However, this has begun to change as it makes its way into the West, where it's analytical approach make it particularly compatible with psychology and psychoanalytic thinking. Theravada Buddhism is practiced in Sri Lanka (where up to 70% of the population is Buddhist), Cambodia, Laos, Burma, Thailand, southwest China, Vietnam, Bangladesh, Malaysia and Indonesia. 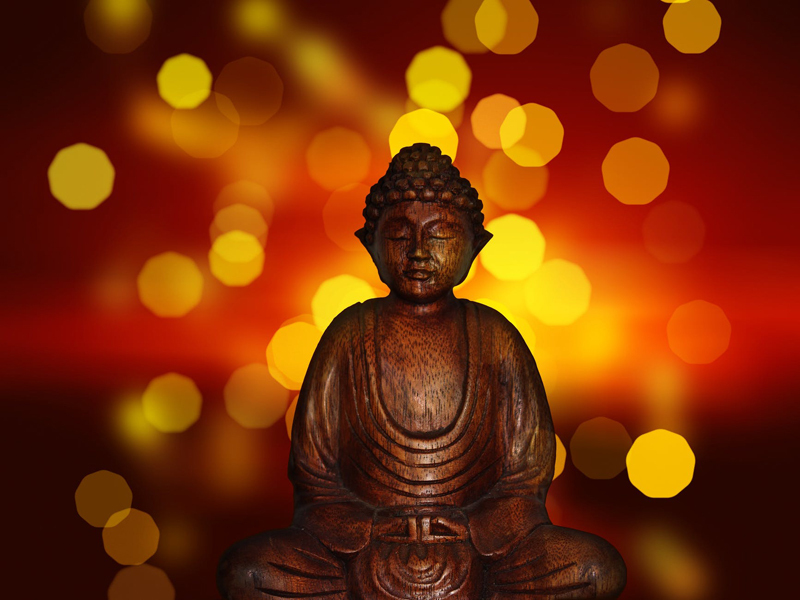 Within the West, Insight Meditation and Vipassana are the two most widespread examples of Theravada teachings. Mahayana - Mahayana Buddhism evolved later than Theravada, probably around the 1st century CE in India. Mahayana means 'great vehicle' and this refers to the fact that most Mahayana schools place great emphasis on the concept of bodhicitta, the compassionate drive to free all sentient being from suffering. Although Mahayana branches vary widely in philosophy and practice, most believe in a lineage of Bodhisattvas - enlightened teachers who have devoted themselves to helping all other beings on the pathway to enlightenment. Mahayana practice often revolves around the concept of compassion, with the development of true bodhicitta as the goal. Mahayana scripture varies widely, with the Lotus Sutra and Heart Sutra being two of the most well-known, but individual schools often also have their own scripture. Mahayana scripture tend to portray Mahayana as an evolution of Buddhism, representing a deeper insight into the Buddha's teachings than Theravada, thus the origin of the label 'Hinayana', or 'lesser vehicle.' But well-known modern Mahayana Buddhist teachers such as Thich Nhat Hanh and the Dalai Lama discourage this attitude, encouraging respect amongst the traditions. There are both monastic and layperson traditions within Mahayana Buddhism, but historically there has been stronger support for the possibility of enlightenment by laypeople in Mahayana than in Theravada. In fact, in many branches, the possibility of enlightenment by anyone of any station in one lifetime is held as a founding tenet. Both Zen and Tibetan Buddhism, two of the mostly widely practiced forms of Buddhism in the West, are considered Mahayana traditions. Other schools are Pure Land, Nichiren, Shingon, and Tendai. Mahayana is mostly practiced in China, Japan, Korea, Vietnam, Tibet, and the Tibetan diaspora throughout India and the West. Each Mahayana school has multiple branches; for example, the primary lineages of Zen are Rinzai and Soto, and Tibetan Buddhism has four main lineages: Nyingma, Kagyu, Sakya, and Gelug. Each has distinct scriptures and practices, although there is much overlap. Vajrayana or Tantric Buddhism is sometimes considered a third branch of Buddhism, but is generally classified as part of Mahayana by academics. Vajrayana lineages are mostly found within Tibetan Buddhism, but Japanese lineages exist as well. Vajrayana Buddhism focuses on esoteric transmission, and highly specific meditative and other practices designed to lead to direct realization of Buddhahood. All Buddhist branches revere the Buddha as the first teacher, and acknowledge the Four Noble Truths and Eightfold Path as founding teachings. Most of the sutras of the Pali Canon are also acknowledged by all branches, although interpretations of them vary.